In December 2005 Narjis Pierre left San Antonio bound for Mecca to join approximately 2.5 million Muslims on Hajj, the foremost pilgrimage in Islam, compulsory for Muslims in good health and with sufficient funds to make the journey. As Narjis explains, Hajj is a spiritual journey as well as a physical one. This journal is a unique glimpse into a Muslim woman’s pilgrimage. Contains 43 rare photos and a 13-page A-Z glossary. A wonderful resource for Muslim women wondering what to expect on their own journey or for others wanting to learn more about the heart of Islam. This accessible yet comprehensive journal would make an exceptional text for a college-level class in world religions or Islam. View the entire book as an online “flip book.” To turn the pages, click your mouse on the narrow gray strip on the right (forward) and left (backwards) edges. We’d like to know what you think of this method of previewing our books! 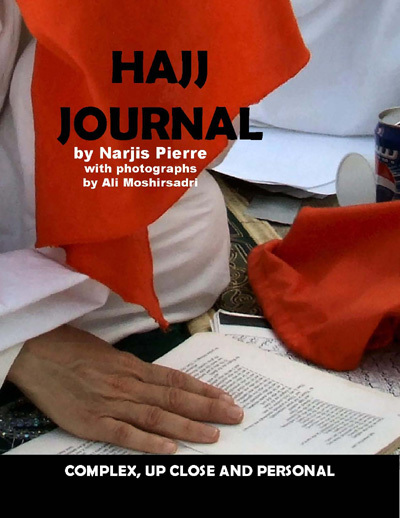 Download a free excerpt: This 9-page excerpt from the Hajj Journal includes the introduction by Ali Moshirsadri; Day 10 of the journey (arrival at ‘Arafat, the tent city); 3 pages of the glossary and a short biographical sketch of Narjis Pierre. About the author: Narjis Pierre is the founder of the San Antonio Muslim Women’s Association and a board member of the San Antonio peaceCENTER.